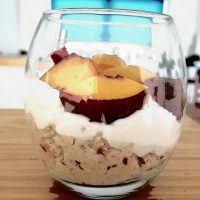 Bircher Pot – Breakfast or Dessert (or both)?! A great way to eat seasonally and suitable for any time of the day really! A tasty blend of oats, apple and other ingredients that help with digestion and great for adding fibre to your diet. Late Summer is all about enjoying what you eat and savouring the natural sweetness of the fruits and grains of the harvest. Top with your favorite fresh and/or dried fruit, nuts, toasted coconut, etc. Combine oats, coconut, milk, apple juice, cinnamon, ginger and lemon juice and let sit overnight in the fridge covered. In the morning (or later!) add the grated apple, honey (to taste) and mix well.